A malfunctioning dishwasher can make your kitchen smelly and unpleasant. It can be quite distressing to have dirty dishes piling up if your dishwasher leaks. 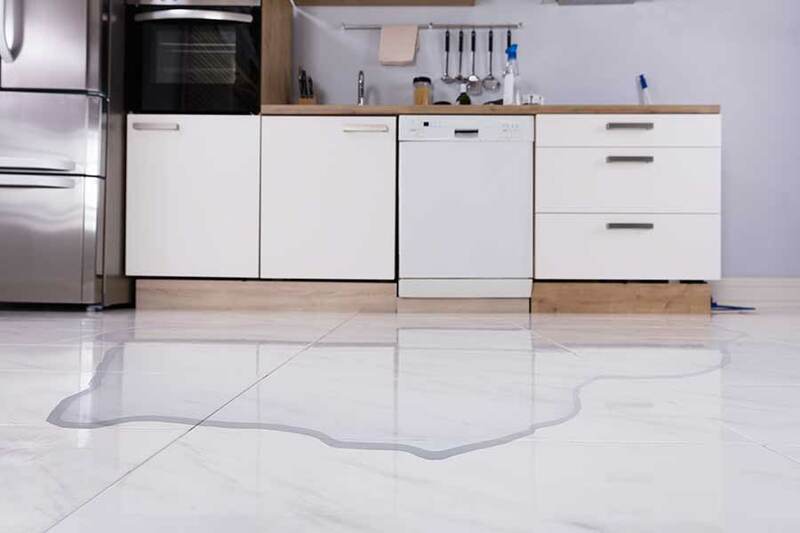 A leaking dishwasher can also result in a constant trail of water on the floor. You will need to clean the floor often to keep it dry. More importantly, a wet environment is an invitation for mildew to grow inside your home. Moldy surfaces translate into poor health for residents and expensive house repairs for areas damaged by moisture. Identify the cause of the leak and repair it soon to reduce potential problems. Read on for more information about why your dishwasher is leaking and what you can do about it. If water is pooling at the front of your dishwasher, the door gasket may not be sealing the dishwasher properly. The door seal of a dishwasher is intended to give it a watertight seal. The rubber gasket circles the tub or the door to ensure that water does not seep out. Some dishwasher models may have baffles as well to prevent water drainage from the bottom corners. The rubber gasket and baffles may wear away with usage and time and lose their sealing ability. Disconnect the dishwasher from its power socket and turn off the water supply from below the sink. Check the gasket seal by placing a paper under it and closing the dishwasher door or lid. If you can pull out the paper with little or no resistance, the dishwasher gasket is due for a change which will resolve the leak. The float and float switch of a dishwasher lies at the base of the tub. The float rises with increasing water levels. When the water reaches a certain cut-off level, the supply is shut off the avoid overflow. A float mechanism can cause water leakage from a dishwasher. Unplug the dishwasher from its power supply. Wait for an additional five minutes before beginning a repair procedure. Open the door of the dishwasher and take out the lower rack and float cover. Disconnect the float form the float switch. Replace the malfunctioning float with a new one. Use a screwdriver if necessary. Check and replace the float switch too if needed. Replace the dish rack and close the door. Plug the dishwasher back on to check if the new float system is working. A dishwasher has a drain hose as well as a recirculation hose. Either of the rubber hoses may cause a leakage of water if they are worn out. Turn of the power supply to inspect the pipes. Remove the lower kickplate panel to access the drain hose. The drain hose runs from the pump below the dishwasher to the sink drain. A leak can be fixed by tightening the clamps of the hose. In case of blockages, run water or wiggle the tube to free up debris. The recirculation hose may be examined too. Reattach the hoses and replace the lower panel of the dishwasher. Plug back the power supply and check for proper dishwasher function. The inlet valve lets in water into the dishwasher tub. An electronic timer controls the valve. The dishwasher pump circulates water around the dishes and drains it away. Unplug the dishwasher from its power supply and turn off the water supply. Remove the lower kickplate panel to access the inlet valve. The inlet valve is attached to two wires and an inlet and outlet water hose. Remove the hoses and collect water spills in a bowl. Disconnect the wires by carefully tugging on the connectors. Unscrew the inlet valve and install a new inlet valve to replace the defective one. Reconnect the hoses and wires to the inlet valve. Check and replace the pump located at the base of the dishwasher if necessary. Replace the lower kickplate panel. Plug into the power supply and check to see if dishwasher function is restored. A dishwasher leak from the front may be traced to a problem with the soap dispenser or grommet. The inner door panel houses the dispenser that is sealed with a rubber grommet. The dispenser is attached to the panel with screws or with a latch assembly. Unplug the dishwasher form its power supply. Inspect the dispenser and the grommet for crack or damaged areas. Replace the defective dispenser or grommet. Plug the dishwasher back on to check for successful repair. Perform regular inspection and maintenance to keep your dishwasher in good working condition. If your dishwasher is leaking and you are in urgent need of help to fix it, contact It Is Fixed Appliance Repair today. We carry parts for major dishwasher brands and offer same day appointments seven days a week!